Cargill Inc., Compass Minerals, and K+S Aktiengesellschaft held a massive 70.4% of the global kosher salt market in 2015. This reflects the nature of the global kosher salt to be largely consolidated with scope of local players to grow predominantly in regional markets. Overall, global kosher salt market is highly unorganized due to the presence of a large number of local players that makes consolidation efforts and calculation of market statistics difficult tasks. As per a recent market study released by Transparency Market Research, the global kosher salt market is anticipated to be highly concentrated in China, along with entry of new players predominantly in developed regions such as the U.S. 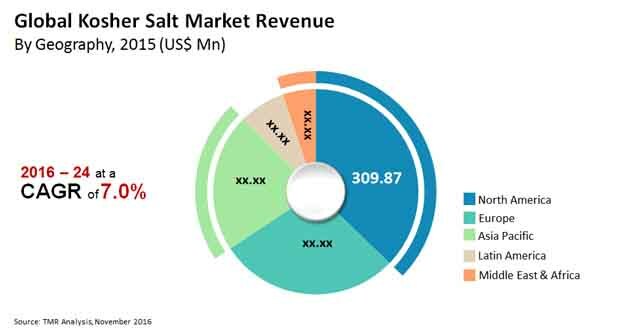 In terms of revenue, the global kosher salt market, which stood at US$823.3 mn by 2015 is expected to reach US$1517.2 mn by 2024 expanding at a CAGR of 7.0% between 2016 and 2024. By volume, the global kosher salt market is expected to rise at 3.7% CAGR between 2016 and 2024. Kosher salts display a unique and lasting advantage over table salt. Due to their mild taste and purity over regular table, kosher salt is preferred for seasoning and cooking meats. Not only does it enhance the taste of the cooked meat, it does not make the preparation overly salty. This makes kosher salt the choice of majority of chefs across the world over regular table salt. “With the expeditious growth of the food and beverage industry along with its food service component, the demand for kosher salt is expected to display an upswing in the coming years,” says the lead author of the study. The attractive physical properties of kosher salt over regular table salt is also driving the growth of this market. Due to the coarse and granular nature of kosher salt, it can be picked by hand for use and for measuring purpose. At the same time, the volume of kosher salt in foods is greater over regular table salt as it is less salty, takes up high surface areas, and exhibits open granular structures. One of the key factors restraining the growth of this market is the negligible use or even zero use of kosher salts in some geographical areas of the world. Certain parts of the world that have a high prevalence of iodine deficiency dissuade the use of kosher salt due to its low iodine content. Table salt is often iodized in these regions, thereby leading to its increased demand. Apart from these locations, the consumption of kosher salt is on the rise in major parts of the world. It is healthier than regular table salt and imparts unique flavor to foods especially meats, two facts that are leading to its increased consumption across the world. With the increasing awareness about health promoting foods that are flavorful as well, it will open growth opportunities for players in the kosher salt market over the coming years. North America is the leading market for kosher salt in terms of both consumption and production. The region is highly likely to be leading in the coming years as well due to the extensive growth of the food and beverage industry. In developed countries of the region, high awareness among consumers about the composition of kosher salt that is less detrimental for health than regular table salt is leading to an increased demand for the former.